Well - if you have come back for more - I salute you. I know my first post was a long'un. And this one, I fear may be longer. My advice, if you choose to stick around, would be to get a cuppa, a pack of Jaffa Cakes (other yummy snackage's are available) and settle in for the next instalment. Now. My old man has a rule when on holiday and paying for a buffet breakfast. Eat. All. You. Can. This served me well last year, as we literally didn't eat from breakfast to dinner. With a large bottle of water inbetween. So, for our first breakfast, I thought I would do that same. What occured was not feeling full, satisfied smug tummness but something more akin to a weeble. A hot, frizzy haired weeble. Although it did exactly what it said on the tin, the thought of anything remotely food related made me want to barf until at least 7pm. In fact - dinner itself nearly made me actually barf -but more on that later. For me an epic Breakfast Fail. This did not stop The Beard sneaking out some pain au chocolates. And stuffing them in later in the day. I had to turn away. It was too much. Villers Bretonneux Australian National Memorial. I had not been to this before and it is something to behold. Immortalising nearly 11,000 unknown Australian soldiers killed between 1916 and the Armistice in 1918, it is a beautiful tribute. There were a lot of poppies stuck by various names. Which I always find incredibly touching. And so began the climb to the top of the tower to take in the view. Again, situated in the middle of crop fields, the views, I am sure, would have been stunning were it not for the mizzle. But, there was a nice breeze to be had, albeit damp. Whilst there I noticed some pock marks all around the memorial. We came to conclusion that they must be battle scars from WW2. And in fact, they were. Turns out that this memorial was used by the French Resistance against the Nazi's due to its high vantage point. Odd that a memorial to commemorate the dead from a previous war, should be used to defend against the onslaught of another. Back in the car and back on the road to The Devonshire Trench Cemetery. A small plot where the trench once was and the resting place of the men who had once inhabited it. I find it incredibly touching that the men who survived buried their friends, possibly relatives, in a place that they had all been together not long before. 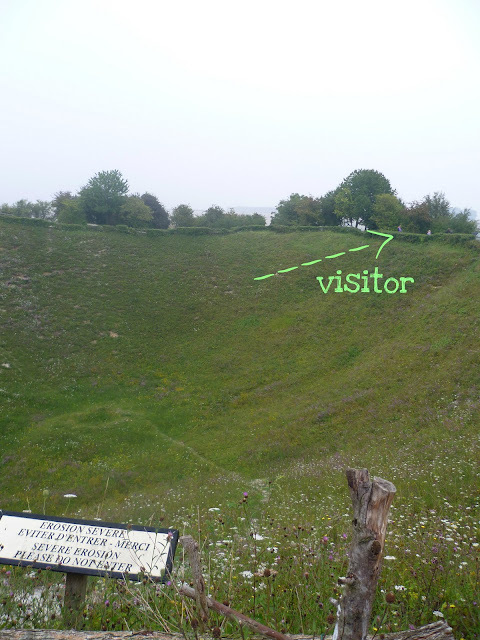 It was only a short stop over and then off again to visit the Lochnagar Mine Crater. When we visited this last year, my Pop's made me close my eyes and guided me to the edge. I have to say, the impact was immense. The size of the crater cannot be described and no photo's I could ever take would show you the size. I have feebly tried to show you the scale below. I am on the opposite side of the crater. I walked around in silence, which takes about 10 mins at a slow amble, pondering different things about the site. The German soldiers who died here when the ground erupted beneath them were at the forefront of my mind, closely followed by the English soldiers who died trying to take the location once the mud and bodies had fallen back to earth and are commemorated by various benches. Why all men who perished here are not, in this day and age, remembered, is beyond me, but it is what it is. The rain settled in as we reached Thiepval Memorial. On the previous visit, the weather was baking and it was the 1st July, so the place was heaving, due to the annual memorial parade to mark the first day of the battle. The memorial commemorates the near on 73,000 British and South African men who died during the Battle of The Somme and who have no known grave. None of them could be recognised. Seventy. Three. Thousand. But, on this visit, the place was practically empty. Which I really liked. I am the sort of gal who likes to visit things out of season, as it were, when there is no one else around. On every expanse of Portland Stone that you can see, there are reams of names. Thiepval reminds me a little of Battersea Power Station for it's strong looking, red-bricked demeanour. It makes me think of home. Which I am sure it is meant to do. There were various mementos left behind by relatives of someone lost. The above was the most touching I saw. No indication as to who they were to the lost soldier - but simply showing that, in some way, he carried on. Now. My hair. It was curled, quite nicely so, when I left the hotel. But the combination of heat and drizzle forced it back into a frazzled version of it's straight self. And this is how I felt about it. Especially that long strand on the right. Eugh. But - I was not glum for long, because just at the top of the car park, I found the sort of thing my own one-day-it-shall-be-mine garden would contain. A wildflower meadow. With the biggest, most scarlet poppies, Mediterranean sea looking cornflowers, sunshine yellow dandelions and pearly white daisies I have ever seen. On that happier note, I shall leave off here. I fear I may be rambling so shall split day two into deux. Oh my word. It is so sad that so many people have to die, so far from home and from the people that love and need them. Thanks for sharing. blub blub-a-lub. I've done a fair bit of genealogy and recently found a relative who was killed in WWI. His headstone is in Esquelbecq Military Cemetery. He was only 19 when he died. I'm sure I have other relatives buried out there, too, but he's the only one I know for sure. I'd love to visit him one day, so this post is pretty inspirational for me. Terrible - I had no idea the German soldiers weren't being remembered. And how touching to see the picture of the lady someone left behind. The sheer scale of the numbers involved in these conflicts is overwhelming, I can never get my head around it, it's terrifying, and utterly appalling. Always makes me weep. I went to see "Journey's End" at the theatre recently, the saddest thing, and the noise of the bombardment that was played over the speakers at the end was shocking. How did they stand it? No wonder so many were traumatised for life, hell on earth. It seems so sad to see all those people that died but it's a lovely memorial. Your brooch is very cute btw. I really enjoyed your last post and this one. Lolly - I too saw Journey's End. The best bit about it was the end. I left sobbing. Thank you for this thoughtful post. I look forward to reading the next installment. The numbers are quite difficult to process aren't they? I imagine the sheer scale of the memorials is hard to take in - and the crater must elicit a real intake of breath. I believe all the German war graves were centralised into various large cemeteries. I know there are five in Belgium, they just gradually moved them all, this continued into the 1950s. I suppose it's worth remembering the enmity towards Germany at the time was terrible. They were a hated and feared foe from 1914 until well after the war. You do occasionally see some references to "all the war dead" and at Etaples in the Pas de Calais there are German graves still in the massive military cemetery on the coast road. I have something to add to the conversation. It's a result of the fire communicated in the article I looked at. And after this article "WW1 Vacance l' Histoire - Jour Deux #1". I was moved enough to leave a commenta response ;-) I actually do have some questions for you if you tend not to mind. Could it be just me or do a few of the responses come across like they are left by brain dead people? :-P And, if you are posting at additional sites, I'd like to follow anything new you have to post. Could you list the complete urls of all your shared sites like your twitter feed, Facebook page or linkedin profile? 400 pence Dress - outfit post.